27946 ENT ETATS UNIS (1883) Bonneterie. Vêtements. Carte postale (O) avec avertissement au verso pour "Jones, Hoar & Co." vêtements pour les hommes. Très beau! 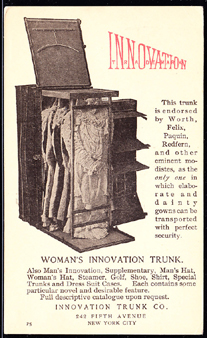 68819 ENT U.S.A. (1904) Trunk filled with women's dresses. 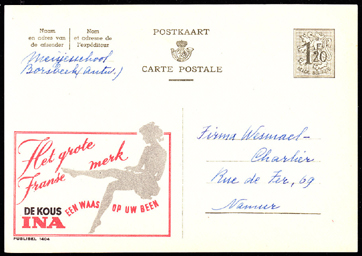 One cent postal card (O) with illustrated ad on reverse for Woman's Innovation Trunk. 68822 ENT U.S.A. (1922) Woman's sport coat. 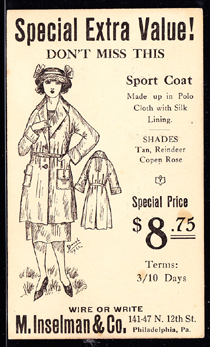 One cent postal card (O) with illustrated ad on reverse for woman's coats (M. Inselman of Philadelphia). 68818 ENT U.S.A. (1927) Uniformed delivery boy carrying hat box. 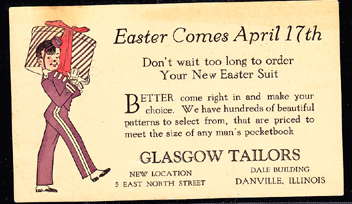 One cent postal card (O) with illustrated ad on reverse for Glasgow (Illinois) tailors. 72702 ENT U.S.A. (1930) Men's shoes. 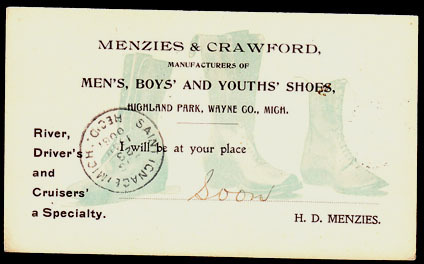 Postal card (O) with illustrated advertisement on back for Menzies men's Boys' and youths' shoes. 14983 EMA ETATS UNIS (1939) Chemises. Empreinte rouge de machine à affranchir sur fragment Pitney Bowes No 89364: "Les chemises lavées par un blanchisseur sont plus belles." 72679 EMA U.S.A. (1940) Washing machine. Violet meter cancel on fragment, P.B. No. 73880, "ABC - America's Leading Washers-Ironers." 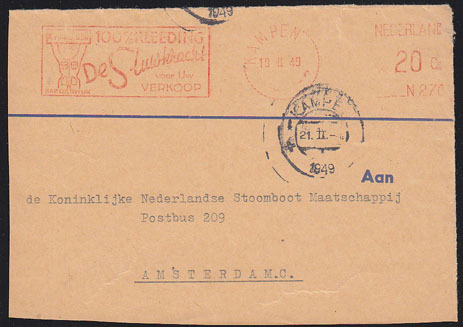 76056 EMA NETHERLANDS (1940) Clothing with pockets*. Red meter cancelation on piece. "100% KLEEDING. De Stuwkbracht Voor uw Verkoop." 72677 EMA U.S.A. (1947) People playing tug-of-war with clothes. Red meter cancel on front, P.B. No. 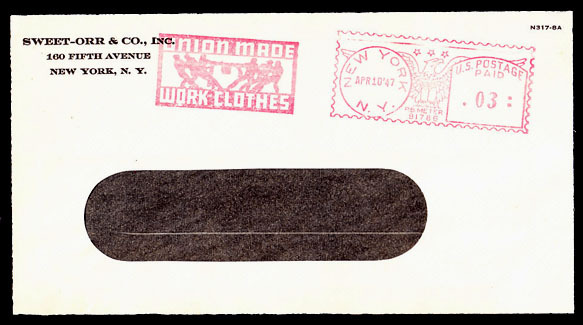 91786, "Union-Made Work Clothes." 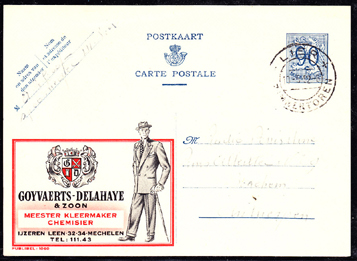 19863 ENT BELGIQUE (1948) Cravates*. Entier publicitaire multicolore (N) à 65 centimes Publibel No 782: "Raxon." 29028 EMA ETATS UNIS (1949) Chemises. Empreinte rouge de machine à affranchir sur pli Pitney Bowes No 122306:Dunham's of Maine. America's No 1 Hathaway Shirt Store. 76108 OBL GERMANY (1949) Scissors*. Triangle*. Special cancelation on unaddressed postcard - Munich Tailoring Day. 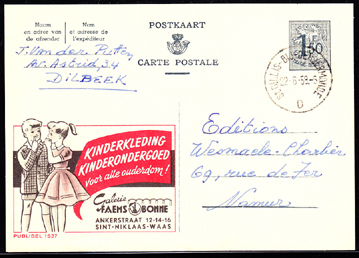 68825 EMA NETHERLANDS (1951) Women's undergarments. Red meter cancel on envelope. K. Van Gelder. 100% Kleeding. 68911 ENT BELGIQUE (1952) Men's clothing. Postal card (O), Publibel No. 1060. Goyvaerts-Delahaye & Zoon. 29030 EMA ETATS UNIS (1952) Homme tombant*. Empreinte violet de machine à affranchir sur pli Pitney Bowes No 180203:Feralun Safety Treads. Don't Slip Up On Safety! 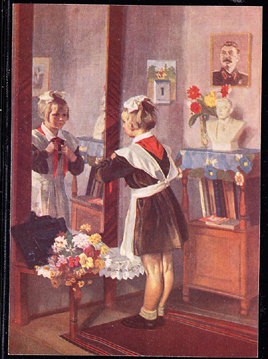 68803 ENT RUSSIA (1954) Girl tying sash in mirror. 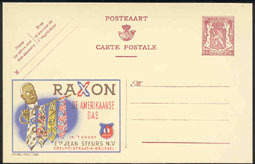 Illustrated postal stationery card (N). 29031 EMA ETATS UNIS (1955) Vêtements. Empreinte rouge de machine à affranchir sur pli CC No 9210:Kuppenheimer Men's Clothes are exclusive at Frank & Seder. 68915 ENT BELGIQUE (1956) Women's nylon stockings. Postal card (O), Publibel No. 1404. Het Grote Franse merk. 68831 EMA GERMANY (1958) Iron. Red meter cancel on card.